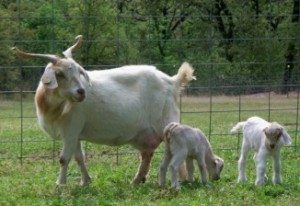 You've found the “Oklahoma Kiko Goat Breeders” page here at Hobby Farm Wisdom! If this is the first time you have visited our site: Welcome! The Kiko Goat was bred in New Zealand for meat production. The Maori word “kiko” means flesh or meat. One of the reasons that they are great for meat is that these goats are able to gain weight substantially without being fed supplementary foods. Kiko goats thrive under natural conditions. Kiko Goats are generally white, although some come in a variety of colors; they have straight profiles, medium-length ears, spiraling horns; wide, strong frames with moderate bone size; and compact, muscular bodies. The Kiko is not affected by climatic variation. It feels comfortable in a sub alpine mountain country or a arid brush land. The kids are born of average size but with considerable vigor. Can’t find the right Kiko Goat in Oklahoma? Check in: Texas, Kansas, Arkansas, Missouri, or Colorado. Or, to see a list of ALL the Kiko Goat breeders in the US: Click Here!